Only sixteen kilometres from Ireland’s attractive Atlantic coast,the village is the Southern Gateway to the famed Burren region,one of Europe’s most distinctive landscapes. 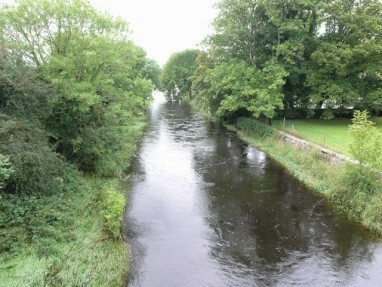 It is situated on the River Fergus ten kilometres from Ennis.The village takes its name from an ancient fording place on the river Fergus,associated in legend with the romantic hero,Fionn Mac Cumhail and his chivalrous warrior band – Ireland’s answer to King Arthur and his Knights. The hinterland is known as Clare Lakelands and Lake Inchiquin beside the village-often referred to as the “Killarney of Clare” was the setting for Barker’s well known An Angler’s Paradise. Set in the unique Burren landscape, Corofin is an old settlement of considerable historical importance having its roots in an estate village created to service the O’ Brien barony of Inchiquin. Catherine Keightley, wife of Lucius O’ Brien and first cousin to the two English monarchs, Queen Mary and her sister Queen Anne, built St Catherine’s Church in the early eighteenth century.The church now houses the Clare Heritage Centre. But Corofin has kept pace with modern developments and the village was recently chosen as one of two Co. Clare villages in a pilot project in which the “Planning for Real” approach to community development was adopted. The Burren region of Co Clare comprises a unique heritage landscape of international scientific interest. For instance, the lower Burren region centred on Corofin hosts some of the most distinctive native flora as well as the densest distribution of prehistoric tombs to be found anywhere in the country- upwards of twenty wedge tombs in the parish of Corofin alone. The accumulation of stone forts, of which Cahercommaun near Corofin is an outstanding example are important elements in the Western Stone Forts Project in the current Archaeological Discovery Programme. The modern village has many tourist attractions.Many fine beaches and golf courses are just a short drive away. Accommodation is provided in first class B&B’s selfcatering and camping. The village has many fine pubs and restaurants. Most pubs provide musical entertainment.In July and August Comhaltas Ceoltoiri Eirinn provides traditional entertainment at Teach Ceilidhe on Thursday evenings. Take in some of the more remote and beautiful parts of the Mountain within the Burren National Park with your guide Marie McGauran. The walks are very much one of engagement and include insight and interpretation on the historical and spiritual landmarks as well as the botany, geology, and farming of the area. See the website for individual walks, booking and more information. We are a micro-tour operator, organising local accommodation, activities and highly qualified guides to give an all-inclusive, intensive, in-depth experience of the landscape and culture of the Burren. Half or Full day activities can also be arranged without accommodation. ‘Burren Journey’, the name of our business, encapsulates a number of ideas; the exploration of an exceptional place (but away from tourist ‘hotspots’), a quest for knowledge with a group of companions and the potential of a journey of self-discovery. The Burren, stretching some 30 kilometres north-south and 40 kilometres east-west, is not a big place and our journey is largely confined to the south-east corner of the area, that part of the Burren within walking and easy cycling distance of Corofin. This focus is intentional for we believe that there are great rewards to be gained in a journey into landscape and community that does not travel far. And we also want to promote a daily rhythm that is not dominated by the shortcomings and conveniences of car travel. You will have a small number of companions (no more than 11 and usually fewer). You come from different places and backgrounds but you all share a lively interest in the world. You are any age from 18 to 80. You are reasonably fit and able-bodied, that is, you can ride a bike and can walk for an hour or two without difficulty. Every Journey involves opportunities to pursue personal interests with experienced guides and practitioners. We offer a variety of options during the week. One day you can choose angling, archaeology, herbalism and visiting sacred sites. Another day you can try biodynamic gardening, botany and wildlife or caving. We classify our Burren Journey collaborators as experts or practitioners or farmers but they all have a broad knowledge of the Burren and its heritage. Visitors are facilitated to find Tranquillity of the Mind through Inspirational Walks in the beautiful Burren and Cliffs of Moher Geopark. Coisceim Anama, which is Irish for Footstep of the Soul, is a walking business in the Burren and Cliffs of Moher Geopark. Our motto is “Coisceim Anama, Footstep of the Soul, Tranquillity of the Mind , through Inspirational Walks in the Burren”. A Coisceim Anama Inspirational Walk allows you to take a step back from the stresses and strains of modern life. The walker is given the opportunity to slow things down, take things one step at a time and awaken the senses. You are invited to walk with others of like mind, visit sacred sites, reconnect with nature and the landscape, a landscape that has a connection with our ancestors. You are given the freedom to breathe, observe, listen, touch, be silent, reflect, process “stuff”, quieten your mind, be present in the NOW and feel grounded. At the end of an Inspirational Walk walkers say that the feel contented, refreshed, awakened, grounded, calm, appreciative, aware, connected, challenged… For some the walk is the start of a personal journey, for others it is a time out and an chance to get away from it all. Celtic Spirituality is incorporated into the walks through active participation of walkers in rituals based on the 4 elements, air, fire, earth and fire. The walks conclude with a simple sacred circle dance. Wednesdays and Fridays @ 10.30 during May, June, July, August and September 2015. Meeting point: Dysert O’Dea Castle, Corofin, County Clare. Meeting point: Burren Fine Wine and Food, Corkscrew Hill Road, Ballyvaughan, County Clare. The Clare Genealogical Research Centre, founded in 1982 by the late Dr. Ignatius (Naoise) Cleary and the Burren National Park Information Centre are both located in this building. The Research Centre provides a genealogy service while the information point provides interpretation on the formation, management and flora and fauna of the Burren in an interactive and educational manner. Free guided walks, talks and activities are organised on a regular basis. was commenced as a relief scheme by Fr John Murphy, during the famine of 1822 on a site donated by Sir Edward O’Brien, M.P., Dromoland. Plans were prepared free of charge by the noted architects, the Pain Brothers, who were then redesigning Dromoland Castle. Completed around 1825, St. Brigid’s was one of the first churches in the county to be built to an architect’s plan. The front doorway was taken from a late medieval church in nearby Kilvoydan (no. 9 on this trail). The mitred head at the front was taken from the old monastic church at Rath (No. 11 on the Dysert O’Dea Heritage Trail). Built by the O’Briens in the 17th century, the market-house has been the location for many enterprises. In 1788 woollen goods were spun and weaved on the upper floor. In 1812 Rev. Frederick Blood, the local rector, received a donation of fifty pounds from Sir Edward O’Brien to establish a school for the poor in the upper room, based on the model developed by the English educationalist, Joseph Lancaster. Other uses included corn and woollen markets, a Mass house, a military and police barracks, a cinema and most recently a residential development. This three-arched cut stone bridge spanning the River Fergus, built circa1790, is a protected structure. The River Fergus flows under the bridge, linking Lough Inchiquin with Lough Atedaun. This waterway is a designated Special Protection Area due to the great variety of resident and migratory wildfowl it supports and a Special Area of Conservation as it contains several important habitats. was built by Richard Brew of Prospect House, Tullycrine, probably around the time of his marriage in 1786 to Alice Adams of Applevale, Corrofin. Leased by Fr John Murphy in the mid-1820s, the house served as a presbytery for the RC clergy until a new presbytery was built at Laghtagoona in 1886. An outbuilding adapted for use as a school in 1825 served as the first national school in the parish until the 1880s. Among the teachers were Michael Cusack, co-founder of the Gaelic Athletic Association and Seamus Mac Curtain, the self-styled ‘last bard of Thomond’. This cobbled lane once led down to ‘Corrofin House’ on the bank of the River Fergus. Home of Máire Rua O’Brien after her eviction from Leamaneh Castle, it later passed to her grandson, Lucius, and his wife, Catherine Keightley who lived there between 1706 and 1717. Catherine was a cousin through marriage of Queen Mary and Queen Anne of England. By 1840 the house was in ruins and a distillery had been built close by. The building which today houses a supermarket was a dance hall in the 1950’s. Over the door is a small plaque with the Irish words “Neart ó Neamh” (Strength from Heaven) and the date 1911. The Corrofin Teach Ceoil, housed in an original 19th century cottage on Market Street, has been operated by the local Branch of Comhaltas Ceoltoiri Eireann since 1972. A summer “Seisiún” with traditional music, song and dance takes place every Thursday evening in July and August and a traditional music festival takes place each February. This lane was the original route from Main Street to the Fairgreen, where fair days were held until the 1950’s. There were two annual fairs, one on the day before Ascension-day, and one on November 22nd. The last livestock fair was held in the streets of Corrofin in the late 1960’s. Associated with ‘Cill Bhaodáin’ a medieval church may once have stood here on the shore of Lough Atedaun. Traces of a circular enclosure, possibly dating to the early medieval period, were still visible in the fields when the first Ordnance Survey map was compiled in the early 1840s. Today a ‘holy well’ and the socketted base of a cross survive to the south-east of the walled graveyard. When a pattern of prayers is undertaken over three days, the well water is said to cure warts. (the lake of the breezes) stretches out below Kilvoydan graveyard. It is a very important waterway for wildfowl and pike fishing. Seasonal changes in the lakes water level due to drainage through the karstic limestone of the region, mean that Lough Atedaun displays turlough characteristics. High surface water levels are indicated by the black moss or turlough moss that grows on the surrounding rocks. In 1847 as the Great Famine persisted, major changes took place in the operation of the Irish welfare service provided under the 1838 Poor Law Act. Four additional Poor Law Unions were created in Co. Clare at Ballyvaughan, Corrofin, Tulla and Kildysert. Corrofin Union, comprising 1,589 inhabited houses and a population of 9,352 persons, was declared in February 1850. A workhouse to cater for 600 of the destitute poor was completed here in Corrofin village in August 1852. Only the admission block remains today. is a community hall built in 1945. The national school was housed temporarily here in the early 1950s. The present National School ‘Scoil Mhuire’, located behind the community hall, was built in 1959. The fields beside the hall are the location for the annual Corrofin Agricultural Show. This church was built by Catherine Keightley, wife of Lucius O’Brien, between 1715 and 1720. In 1820, the vestry and tower were added and stained glass windows inserted. Functioning as a church until 1974, the building was later adapted to accommodate the Clare Heritage Centre, where exhibits depicting life in 19th Century Ireland and a 12th century Tau or T-shaped cross from nearby Roughan Hill can be viewed. Built between 1470 and 1490 by Diarmuid O’Dea, this castle was partially destroyed in 1691 during the Cromwellian wars. Restored in the 1980s by the Dysert O’Dea Development Association, it retains many original features. Now the home of the Clare Archaeology Centre, the castle is open to visitors between May and September and at other times by appointment. An extensive collection of local historic artefacts, an audio-visual presentation and well-informed tour guides enhance the visitor experience. Adjoining the north exterior wall of Dysert O’Dea Castle are the remains of a medieval house. Located in the wet grassland below the castle and house are a well and two fulachta fia or cooking sites which may have been in use from the Bronze Age up to early medieval times. To the south-east of the castle, at the edge of the car park, are the remains of a second medieval house. The placename ‘Dysert’, derives from ‘Dísert – Tóla’, meaning the quiet place or hermitage of St. Tóla, who established a monastery here in the 8th century. This 12th century high cross possibly marked the boundary of the monastery. On its east side is a representation of Christ with arms outstretched, below which is the figure of a bishop, believed to be St Tóla. The detachable (now missing) right arm of the bishop may have been used for bestowing blessing or curing an illness, for carrying in procession or as a talisman in battle. St Tóla’s Well which may have been the water source for the ancient monastery, is located to the south of the High Cross, approximately 100 metres downhill. It was frequented by local people on ‘patron’ day, March 30th, when prayers were recited and intentions sought. This tradition continued until the mid 1800s when the well was blocked up by the landlord, Edward Synge, a noted evangelist. It was re-opened in 1986 and is now surrounded by a wooden fence. This stone church, much of which dates to the 15th and 16th centuries, is believed to stand on the site of St Tóla’s 8th century monastery. The ruins show evidence of successive periods of re-building and repair. Several of the O’Dea clan are buried within its interior. The magnificent 12th century Romanesque doorway with its highly decorated arch is one of the finest examples of its type in Ireland. The outer order is decorated with twelve human and seven animal head carvings. To the north of the church is the ruin of an 11th century round tower. It is said to have been knocked by Cromwell’s forces during the church repressions of the 1640s. A carved coat of arms survives over the doorway of this Georgian style lodge, built in the 19th century by local landlords, the Synges. Originally the family name was Millington, after the area in Cheshire, England where the family originated. The name Synge was first adopted in 1584. Tradition maintains that the motto ‘Caelesta Canimes’ (we will sing in Heaven) was given to the family by King Henry VIII when he heard one of the family sing in his church choir. The playwright, John Millington Synge, is said to have derived from this family. This section of the trail follows part of an ancient road between Corrofin and Ennis which is likely to date back to the medieval period. Several ancient paving flagstones can still be seen on the surface of the track and an early stone bridge crosses a small stream. Today, this quiet walkway is lined with hedgerows which support a magnificent array of wildflowers, shrubs and trees. Panoramic views across the surrounding landscape reward you as you ascend gently to higher ground. Cathair Mhic Gormáin and Cathair Mhic Eoghain are two stone forts which were probably built between AD1000 and AD1500 and were likely inhabited up to the 16th century. A great battle took place here in 1563 between Conor O’Brien, Earl of Thomond and his kinsmen Domhnall and Tadg O’Brien. The O’Deas fought on the Earl’s side but were eventually defeated with great losses. Tobar Oireachta – The Well of the Assembly is a spring well which was once famous for the cure of eye ailments. Today local people still draw drinking water from this source and leave votive offerings on a small blackthorn bush that grows out of the wall surrounding the well. The ruins of Rath Church, date mostly to the 15th or 16th century. But incorporated in the walls are several early 13th century decorated stones. Inserted in the south interior wall are a window sill-stone carved with foliate decoration and serpent’s heads, a carving of a distorted figure known as a Sheela-na-gig (believed to have been used to ward off evil) and a stone decorated with a floral motif. Near the southern end of the remains of the exterior east gable, lying on its side, is one face of a carved stone illustrating a man crouching on a stool. Below the church, the ruin of Rath Castle is visible on the shore of Lough Raha. Family run farm promoting a healthy way of living through fun farm activities & educational workshops. Darragh, together with his wife Aisling established The Farmyard, a farm based enterprise which promotes a healthy way of life for adults and children alike. The Farmyard is an interactive farm rooted in a healthy, natural, organic ethos that encourages people to live, work and play the natural way. The Farmyard is an educational haven offering children and students of all ages the opportunity to connect with nature. Children are encouraged to get involved in a range of activities where the focus is on active learning in a fun environment. Set on a working farm in the heart of the Burren in Corofin, Co. Clare, the farmyard is equipped with modern state of the art indoor and outdoor facilities. Interact with the farm animals by participating in simple farm activities such as collecting the eggs, gathering the animals, feeding the goats, milking the cows and many more. -Learn how to milk a cow & make butter the traditional way. -Enjoy the famous farm trials such as gathering the sheep in the fastest time. -Get involved as the farmer shears the sheep and rolls the wool. -Explore the link between the food we eat and the land it comes from. See first hand how vegetables & herbs grow and learn how to grow your own. -Learn how to make pizza using organic produce from the garden. Located in the Burren National Park next to Mullaghmore mountain overlooking the Burren landscape. There are two individual self catering apartments sleeping up to 6 resp. 4 people. Owned by Marie McGauran of Burren Guided Walks & Hikes - group/individual walks can be arranged. Cragmoher House & Courtyard has three self-catering holiday rental apartments in a splendid country setting, at the Southern Gateway to the Burren and Cliffs of Moher Geopark in Ireland West. These self catering holiday rental apartments are beside the quaint old village of Corofin giving an ideal base from which to explore the Burren National Park, the renowned Cliffs of Moher and the inland waterways of the Shannon Region. The Coachhouse – 2/3 Bedroom Luxury Self-Catering Holiday Rental Accommodation, sleeps up to 7. The Coachhouse is a two-bedroom unit (one bedroom has an en-suite shower) of about 110 square metres including a conservatory. The second bedroom has both a double and a single bed. This unit has the benefit of the addition of a first-rate double sofa-bed in the living room, for extra guests. The open-plan living-room, with kitchen and breakfast areas, is beautifully well lit by the large picture window filling the old arched coach-entrance. There is also a shower room and toilet off the main entrance hall. There is a large summer conservatory-room at the back of the unit, which makes an ideal games room, dining room and relaxation space. Unit one can sleep up to seven guests. The Coachhouse and the adjoining Stables can be rented separately or as one large family unit. The Stables has its own separate entrance to the left. This unit is about 160 square metres in size, including the conservatory. It is also a two-bedroom unit (one bedroom has an en-suite shower), with the addition of a first-rate double sofa-bed in the living room, for extra guests. The second bedroom has both a double and a single bed. There is a cosy living-room, with a separate kitchen-diner. The well-appointed main bathroom is upstairs. There is a very large summer conservatory-room at the back of the unit, which makes an ideal games room, dining room and relaxation space. The Stables and the adjoining Coachhouse can be rented separately or as one large family unit. The Ghillies Cottage (the former gamekeeper’s home for Cragmoher Estate) is a very cozy one-bedroom, two-storey dwelling – perfect for a romantic getaway, with views of Cragmoher Lake and the surrounding woodlands and pasture. The cottage comfortably sleeps two or up to four – it has one bedroom upstairs with a king-size bed and also a good-quality pull-out double sofa-bed in the main living room, with separate kitchen (with cooker, hob, microwave, dishwasher and washing-machine) and shower room.